In the context of aircraft flight, the dihedral effect is the phenomenon of roll moment created from sideslip. The dihedral effect of an aircraft is largely affected by its dihedral angle, which is the angle of deflection of the wings from level in the roll plane. Positive values indicate the wing tips are above the wing roots (the wings go up as they get farther from the plane), while negative values indicate the tips are below the roots (the wings go down as they get farther from the plane). When the aircraft rolls, this effect will tend to either create a restoring moment or a deviating moment, respectively. In other words, a positive dihedral angle tends to increase stability, while a negative dihedral angle tends to increase maneuverability. These both have their applications, as stability is desirable for passenger and cargo planes and the like, while maneuverability is preferable for fighter aircraft. 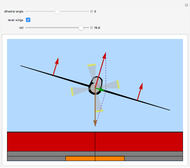 Sideslip refers to an aircraft traveling along a path that is not completely parallel to the center line, that is, the direction of oncoming air is slightly sideways, pushing against one side of the aircraft. 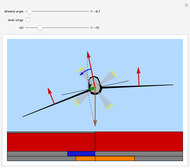 Sideslip occurs during nonlevel flight and is a result of the uncompensated horizontal component of lift generated by the wings (since lift always acts perpendicularly to the wings and weight always acts downward). The sideslip is shown graphically in the Demonstration by the green vector. Again, this is the net force of the center red lift vector and the brown weight vector. The center red lift vector is the sum of the individual lift vectors on each wing. Since the lift of a wing always acts perpendicularly to the surface, the lift created by each wing partially counteracts the other with a nonzero dihedral angle. Consequently, while a large dihedral angle could provide a substantial roll moment effect, it also decreases the total lift. 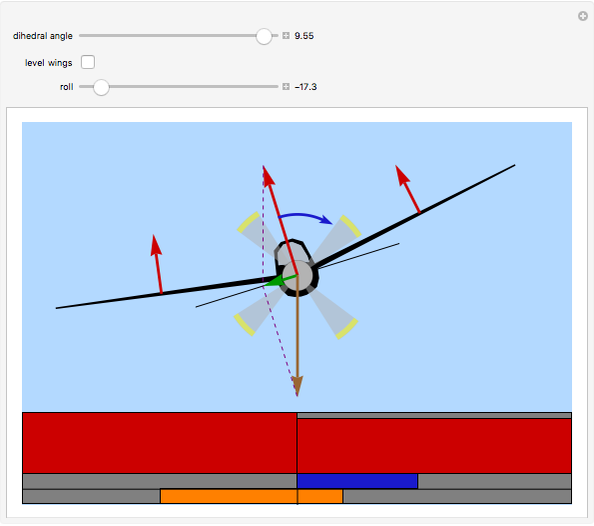 The angle of attack of each wing is shown by the orange bar at the bottom, the roll moment is shown by the blue bar, and the red bars are the lift generated by each wing. 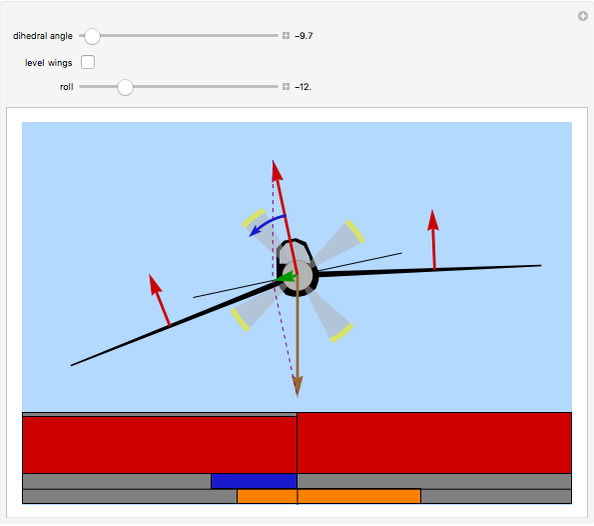 Notice that with no dihedral angle each wing has the same constant angle of attack, so there is no difference in the lift generated by each wing, and no roll moment is created from the sideslip. With a nonzero dihedral angle, the difference in the angle of attack of each wing, and thus the lift they create, is responsible for the dihedral effect. Mark Peterson "Dihedral Effects in Aircraft Flight"